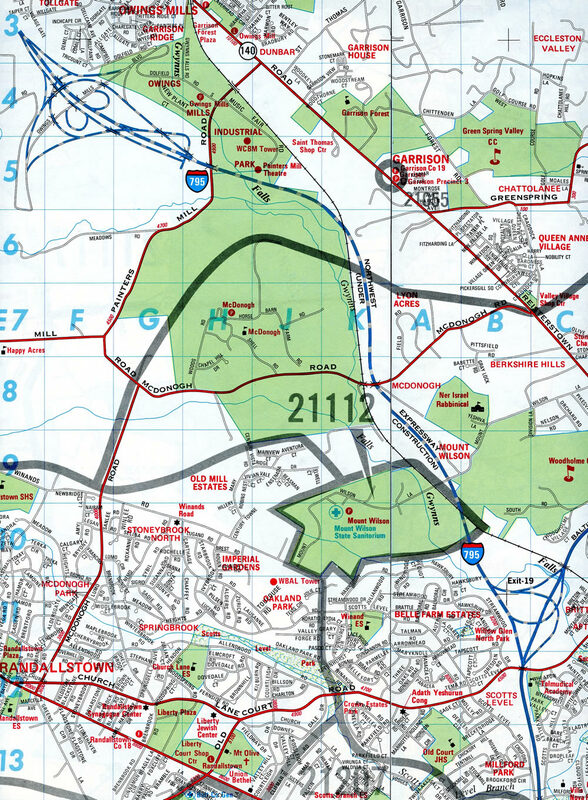 Named the Northwest Expressway, Interstate 795 serves Reistertown, Westminster and other suburbs in Baltimore County. The freeway is six lanes wide between Interstate 695 and Owings Mill (Exit 4) and four lanes wide for the remainder of the route to Reistertown. The Maryland Transit Administration (MTA) Metro SubwayLink runs along I-795 between Owings Mill and the Baltimore Beltway between the north and southbound roadways. Original plans for the Northwest Expressway extended the route southward from I-695 to Wabash Avenue in the city of Baltimore. The proposed corridor followed the Metro SubwayLink line through the Mount Hope and Forest Park neighborhoods. The urban freeway spur was never built and Wabash Avenue was instead constructed as a six-lane surface arterial. Baltimore street atlas pages showing initial construction for Interstate 795 in 1984. MD 30 (Hanover Pike) southbound at unsigned MD 795 south and MD 128 (Butler Road) east at Reisterstown. Photo taken by Tim Reichard (02/24/02). MD 140 extends 12 miles beyond the freeway end of I-795 to Westminster. MD 30 branches north from MD 140 to Hampstead en route to PA 94 and Hanover, Pennsylvania. Photo taken 06/20/12. The first in a series of freeway ends signs for Interstate 795 north. These were erected along the Northwest Expressway by 2001. Photo taken 06/20/12. Crossing over Cockeys Mill Road, I-795 approaches the separation with MD 795 (Exit 9A) to MD 140 east at Reisterstown. An unsigned route, MD 795 comprises a controlled access road 0.47 miles east to MD 30 (Hanover Pike) and MD 128 (Butler Road). Photo taken 06/20/12. Entering the wye interchange (Exit 9A) with MD 795 north into Reistertown. Exit 9B represents the continuation of I-795 north onto MD 140 (Westminster Pike) westbound. Photo taken 06/20/12. Taking Exit 9B, MD 795 intersects MD 140 (Westminster Pike). The towns of Hampstead and Manchester lie north along MD 30 while unincorporated Glyndon is just east of MD 30/795 along MD 128 (Butler Road). Photo taken by Tim Reichard (02/24/02). Curving westward, I-795 concludes at a wye interchange with MD 140 (Westminster Pike) along side Reisterstown Regional Park. Photo taken 06/20/12. Maryland 140 (Westminster Pike) transitions to a rural highway leading northwest from Reistertown. Ensuing signals operate at Nob Hill Park Drive and Gores Mill Road south. Photo taken 06/20/12. Eastbound Maryland 140 splits with Interstate 795 south just beyond Mitchell Drive to Reisterstown Regional Park. Photo taken 06/20/12. 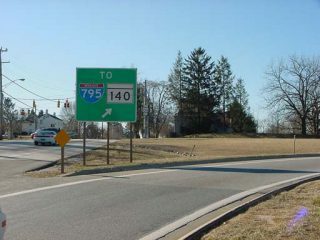 Maryland 140 (Westminster Pike) continues east from the wye with I-795 into Historic Reisterstown. I-795 parallels the state route to the west en route to Owings Mills and Pikesville. Photo taken 06/20/12. Previous guide signs and trailblazers posted along MD 140 (Westminster Pike) east at I-795. Photo taken 06/00. I-795 and the Metro SubwayLink weave southward along side Gwynns Falls to the exchange with Interstate 695. Advance signs partition motorists for I-95 leading away from the Baltimore area. Photo taken 06/20/12. Exit 1B departs from the outside lanes of I-795 south for outer I-695 to Catonsville, Arbutus, Halethorpe and Glen Burnie. Photo taken 06/20/12. Two lanes navigate along a flyover from Exit 1A to inner I-695 to Pikesville, Towson, Parkville and Overlea. Photo taken 06/20/12. Interstate 795 south concludes at a directional T interchange with the Baltimore Beltway. The MTA Old Court station lies within the exchange. Photo taken 06/20/12. Interstate 695 heads north between the Lochearn and Randallstown communities to Exit 19 with the Northwest Expressway. Photo taken 06/20/12. Inner I-695 expands to five lanes leading into the directional T interchange (Exit 19) with Interstate 795. I-795 spurs northwest between Randallstown and parallel Maryland 140 to Owings Mills. Photo taken 06/20/12. Exit 19 leaves the Baltimore Beltway for I-795 north to Reisterstown. The Northwest Expressway replaced Maryland 140 (historic U.S. 140) along part of the route to Westminster. Photo taken 06/20/12. Curving southwest through Pikesville, Interstate 695 meets Maryland 140 (Reistertown Road) at a SPUI (Exit 20) one mile ahead of I-795. Photo taken 06/20/12. The forthcoming exchange joining Interstate 695 outer with Interstate 795 dates from 1983-84. Photo taken 06/20/12. A CSX Railroad line spans I-695 at the departure of Exit 19 for the Northwest Expressway. Photo taken 06/20/12. Page updated February 4, 2019.